Protein is a recurrent problem for vegetarians and vegans. Protein is a key nutrient needed to form muscles, so it can’t simply get cut out of one’s diet. Unfortunately, protein mostly comes from animal sources. Without eating meat, it can be tricky to get the necessary amount. Fortunately, protein comes in a variety of sources. So with some searching and a bit of knowledge, it can be a simple matter to regain the necessary nutritional value through meatless protein. But first, what is the difference between a vegetarian diet and vegan diet? A strict vegetarian diet will include plant-based foods, but it may also include dairy and eggs; therefore, you will often hear it called an ovo-lacto vegetarian diet. A pescatarian vegetarian diet will include fish and seafood with plant-based foods, as well as dairy and eggs, but no poultry, beef, or other red meat. A vegan diet will consist of only plant-based foods and avoid all animal products, including meat, fish, eggs, dairy, and even honey. The benefits of getting your meatless protein sources have less to do with protein itself than with what else you’re eating. Vegetarian diets naturally have more nutritious foods in them that can assist in preventing a host of health conditions and help you lose weight. The significant lack of cholesterol in a vegetarian diet can help improve heart health, fiber can improve feelings of fullness, and you will get more essential vitamins to boost bone health, immune strength, and many other bodily functions. It’s also worth noting that the World Health Organization has recently linked regular processed meat intake to an increased risk of colon cancer, so getting that out of your system can keep you free of carcinogens. What Are the Common Protein Sources for Vegans and Vegetarians? So, without meat, how do you get your protein? It’s tricky, but not too hard overall. There are many good plant-based meatless protein sources for vegans, such as nuts, seeds, legumes, soy foods, nutritional yeast, spirulina, quinoa, and more. Dairy and eggs are also decent protein foods for vegetarians. Peanuts, walnuts, pistachios, almonds, cashews, and more are all fine sources of protein for vegans and vegetarians. Nuts are great for a quick snack or to use as an extra ingredient in dishes to add heightened flavor. Natural nut butter also falls under this category, and common nut butters include almond butter and cashew butter. Nut butters can also be used in sandwiches and delicious fruit dips, or as a smoothie ingredient for taste and thickness. Although nuts contain extra nutrients like fiber, calcium, potassium, and iron, they also have a noticeable fat content. 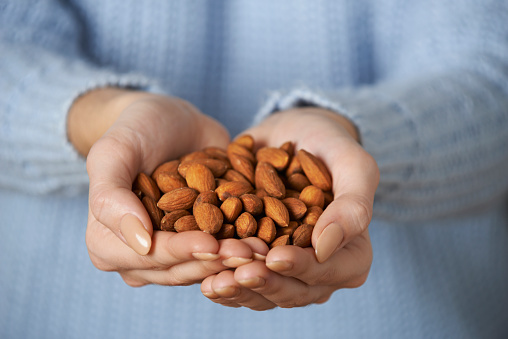 Fortunately, nuts contain the good kind of fat, but you should still avoid overindulging. A quarter cup of almonds has over seven grams (g) of protein, walnuts have four grams, and pistachios have six grams. Peanut butter gets its own section here, since it is a common vegetarian protein source. Peanuts are considered a culinary nut, but they’re actually a type of legume. Two tablespoons of peanut butter contain eight grams of protein, while a half-cup of peanut butter contains 32.5 grams of protein. However, peanuts are also high in omega-6 fatty acids, and this can lead to type 2 diabetes, obesity, asthma, irritable bowel syndrome, and more. The mold sometimes found in peanuts is another big reason why peanut allergies are a serious issue. When you consume peanuts or peanut butter, make sure you purchase a raw and certified organic brand, and try to add an omega-3 fat source like flaxseed oil. Which has more protein: 100 g of sunflower seeds or the equivalent amount of a sirloin steak? You may be surprised to know that the amounts are actually comparable—around 20 g of protein each. Seeds, whether sunflower, sesame, pumpkin, hemp, or otherwise, are similar to nuts in that they are something you can munch on their own or mix into a variety of dishes. Chia seeds (Salvia hispanica) are also a good meatless protein source. An ounce, or about 28 g, of chia seeds contain around 4.4 g of protein. On top of all that protein, chia seeds are also a good source of calcium, magnesium, iron, selenium, phosphorus, fiber, and omega-3 fatty acids. There are so many great ways to use chia seeds as well. Chia seeds are able to absorb water, and can turn into a gel-like substance. As a result, you can make a chia-egg, chia puddings, or use it in baked goods and smoothies. Another good meatless protein food is hempseed (Cannabis sativa). Hempseed belongs to the same family as the marijuana plant; however, hempseed only contains trace amounts of THC (tetrahydrocannabinol)—the compound that produces psychoactive effects. An ounce, or 28 g, of hempseed contains nearly 10 g of digestible protein. It also contains fiber, omega-3 fatty acids, vitamin E, magnesium, manganese, phosphorus, iron, copper, selenium, and zinc. Hempseed can be added to your smoothie or salad. It also makes a great addition to protein bars, pestos, baked goods, hemp milks, and salad dressings. Whether as a side dish, mixed with veggies, added to a bean dip, used as a thickener in soup, or mashed up as a patty or puree, legumes have a lot of options for dietary inclusion—and they are well deserved. Legumes are low in fat and sodium, cholesterol free, and rich in potassium, iron, and magnesium levels. It’s easy to see why this group is a good choice for meatless protein. This section will take a deeper look at legume protein sources for vegans and vegetarians. Black beans, pinto beans, kidney beans, and chickpeas all contain high amounts of protein. For instance, one cup of cooked chickpeas or black beans has 15 grams of protein. Chickpeas, in particular, are high in complex carbs, manganese, folate, copper, phosphorus, iron, magnesium, potassium, and zinc. Legumes like chickpeas can be added to salads, pureed into hummus, and baked into a crispy snack. Other legumes and beans like black beans can be added to salads and made into dips. Black, kidney, and pinto beans also make for great vegan and vegetarian chili. Lentils have protein comparable to a chicken breast (26 g of protein per 100 g) and black beans are handy for managing blood sugar levels in diabetics. Cooked lentils have 18 g of protein in just one cup. Lentils are also loaded with fiber, folate, manganese, phosphorus, iron, copper, vitamin B1, magnesium, potassium, zinc, and vitamin B6. How do you use this meatless protein source? The most common types of lentils include green, red, brown, French green, and yellow lentils. Add cooked lentils to fresh salads, pureed soups, vegan burgers, dips, and dahls. Edamame (soybeans) are not only delicious, but they are also rich in protein and isoflavones. Tofu does not have the same level of protein content as other items here, but it is a very versatile food that can be used to replace meat, noodles, or other items easily. Edamame can be used as a snack or added to pastas or salads. A fermented soy product called tempeh can also be baked, steamed, or sautéed for about 15 minutes, and added to main courses and side dishes. Tempeh can also be a great meat substitute, and it may even improve your cardiovascular health. Edamame has 29 g of protein per cup, while four ounces of tempeh has 21 g. Also, four ounces of tofu has nine grams of protein. Natto is another type of fermented soybean that contains 31 g of protein per cup. Natto is often used to make a traditional Japanese natto breakfast, and it is combined with pickled veggies and rice. Special mention needs to go to seitan and its spectacular protein content. This wheat gluten can be used to make meat or noodle substitutes and offers low sodium, low carbs, and is high in iron and calcium. Since it is literally gluten, seitan isn’t advisable for everyone. If you can have it, though, it is highly recommended. About 100 g of seitan has 75 g of protein, more than enough to meet the daily requirement. Quinoa is a gluten-free grain and complete protein food, and is considered one of the better protein sources for vegans and vegetarians. This is a seed used as a grain, and it contains eight grams of protein per cooked cup of quinoa. Quinoa is also loaded with other nutrients, including fiber, manganese, folate, phosphorus, iron, copper, magnesium, zinc, and vitamin B1. There are multiple types of quinoa, such as red, white, and black quinoa. Quinoa flakes make for a good breakfast cereal, or they can be added to salads or vegetables. Quinoa flours also make breads and pastas for a healthy gluten-free alternative. Spelt flour is a grain that is closely related to wheat. Although spelt flour does contain some gluten, people seem to tolerate it more easily than wheat flour. One cup of cooked spelt flour contains about 11 g of protein. Other key nutrients in spelt flour include vitamin B1, vitamin B3, vitamin B6, manganese, phosphorus, magnesium, copper, iron, and zinc. Spelt can be used as a wheat alternative in many recipes, and can be used in bread, baked goods, crackers, polenta, risotto, pasta, and pizza dough. Teff is another gluten-free grain and good meatless protein source for vegans and vegetarians. One cup of cooked teff contains 10 g of protein. It is also loaded with fiber, manganese, magnesium, phosphorus, iron, copper, zinc, calcium, vitamin B1, vitamin B3, and vitamin B6. Teff can be used to make flatbreads, wraps, pancakes, and porridge. Wild rice contains about 1.5 times as much protein as other varieties of long-grain rice, such as basmati and brown rice. A cup of cooked wild rice contains 6.5 g of protein. Other important nutrients in wild rice include manganese, magnesium, zinc, phosphorus, vitamin B2, vitamin B3, vitamin B6, folate, and copper. Cooking wild rice is easy; simply combine a cup of uncooked wild rice with three cups of water in a pot, heat it to a boil, reduce the heat and cover, and let it simmer for 35 to 50 minutes. Washing wild rice before cooking may also reduce its arsenic content. Cooked wild rice can then be added to soup, vegetables, and tortillas. Nutritional yeast is a deactivated strain of Saccharomyces cerevisiae yeast that is sold as flakes or yellow powder. A quarter cup of nutritional yeast contains nine grams of protein. It is also packed with vitamin B1, vitamin B2, vitamin B3, vitamin B6, vitamin B12, folate, and zinc. Nutritional yeast has a cheesy and nutty flavor often used to imitate cheese in vegan dishes, dressings, and sauces. Nutritional yeast can also be sprinkled on pasta or popcorn and used in scrambled tofu and mashed potatoes. From a protein perspective, vegans and vegetarians should also say “pass the peas.” Green peas are the seed of the pod-fruit Pisium sativum, and they contain 8.6 g of protein in one cooked cup. Green peas are also high in vitamin K, manganese, vitamin C, vitamin B1, vitamin A, folate, phosphorus, and vitamin B6. Green peas can be used as a side; added to salads, soups, rice dishes, pastas, risottos, guacamole; and pureed into spreads and dips. Spirulina is blue-green algae that is a nutritional vegan and vegetarian powerhouse. Just one ounce of spirulina contains 39 g of protein. It also contains significant amounts of copper, iron, magnesium, manganese, potassium, vitamin B1, vitamin B2, vitamin B3, vitamin B5, and vitamin K.
Spirulina can be used in green drinks, smoothies, and certain chocolate baked goods. Eating more oats and oatmeal is another easy way to add protein to your diet. A half-cup of regular dried or rolled oats contains five to six grams of protein. Oats also contain a good amount of fiber, manganese, selenium, phosphorus, magnesium, iron, zinc, vitamin B1, copper, and vitamin B5. Oats and oatmeal make for a quick breakfast, but you can also use them in baked goods, cookies, protein bars, pancakes, and vegan burgers and meatless loafs. You can also get a lot of protein from eating chocolate. There is about one gram of protein per tablespoon of unsweetened cocoa powder, and about 17 g of protein per cup. Cocoa powder is also full of fiber, manganese, magnesium, copper, iron, phosphorus, potassium, and zinc. Cocoa powder can be consumed in dark chocolate or added to puddings, vegan chocolate mousse, protein bars, hot or cold cocoa drinks, and smoothies. Cow’s milk and soy milk actually have comparable protein levels (3.3 g per 100 g), so which you use depends on whether you want to go vegetarian or vegan. Soy milk can benefit vegans, and lacto-vegetarians can have cow’s milk and other dairy products. The calcium in cow’s milk and dairy can help bones and teeth and the fat content in milk is relatively low as well. Cheese can also be a handy ingredient or stand-alone snack, and yogurt is always welcome as a breakfast meal, snack, or as the base of a dessert dish. One ounce of Swiss cheese has eight grams of protein and cheddar has seven grams. One cup of fat-free yogurt can have as much as 14 g.
Cottage cheese and Greek yogurt also make decent protein sources for lacto-vegetarians. One cup of low-fat, 1% milk fat cottage cheese contains 28 grams of protein, as well as some vitamin B12, phosphorus, selenium, calcium, and vitamin B2. Greek yogurt can be made from cow, sheep, or goat milk, and it contains about 29 g of protein per cup. Consume organic dairy sources that are free of antibiotics and steroids, and made from pasture-raised sheep, goats, or cows. Dairy products should still be avoided in people with lactose intolerance, skin problems, hormonal problems, and autoimmune issues. Dairy isn’t all bad, and fermented probiotic yogurt or kefir may be better than Greek yogurt since probiotics are good bacteria that benefit digestion and the immune system. Organic eggs are a perfect protein source for ovo-vegetarians. One large, hard-boiled organic egg contains about 6.3 g of protein. Eggs are also full of selenium, vitamin B2, vitamin D, vitamin B12, phosphorus, folate, and vitamin A. Also, make sure you choose free-range eggs. Free-range eggs contain a quarter less saturated fat, a third less cholesterol, two times more omega-3, three times more vitamin E, and seven times more beta-carotene. Eggs can be hard boiled, soft boiled, poached, fried, scrambled, or made into quiche or a casserole. You can also add eggs to Cobb salads or combine them with potatoes and other vegetables. Cook the pierogi according to the package directions. Meanwhile, heat the oil in a medium skillet over medium heat. Add the onion and cook, stirring occasionally, until tender, for five to six minutes. Add the apple, cabbage, parsley, vinegar, caraway seeds, 1/2 teaspoon of salt, and 1/4 teaspoon of pepper. Cook, stirring, until the cabbage is slightly wilted but still crunchy, for four to five minutes. Serve with the pierogi and (optional) sour cream. Place half of the squash in the microwave and microwave for 10 minutes. Let it cool and then drizzle with olive oil and salt. In the meantime, mix the cream of mushroom soup, cinnamon, and yogurt in a bowl. When the squash finishes baking, scoop it out of the skin and place it on a plate. Pour the mushroom sauce mixture over the squash and mix with a spoon. Protein is a key nutrient for muscle growth, blood sugar stabilization, promoting healthy brain function, and balancing your mood. The problem is, vegans and vegetarians have a much more difficult time getting enough protein in their diet. That being said, meatless protein options are possible, but you need to know where to find vegan and vegetarian protein. Protein sources for vegans and vegetarians include nuts, seeds, and nut and seed butters; legumes like chickpeas and lentils; soy foods like tempeh, natto, edamame, and tofu; grains like quinoa, spelt, seitan, teff, wild rice, oats, and oatmeal; and nutritional yeast, green peas, spirulina, and unsweetened cocoa powder. Lacto-ovo vegetarians can also have organic eggs and dairy products like yogurt and cheese. Are you new to meatless protein sources? Try a meatless transition with one entirely meatless protein meal per week, and also add meatless protein foods like grains or soy foods to your meals several times per week. High-Protein Diet: Can It Do More Harm Than Good? “10 Tips for Meatless Meals,” WebMD web site, http://www.webmd.com/food-recipes/10-tips-for-meatless-meals?page=3, last accessed November 9, 2015. “20 Meatless High Protein Foods (Good Vegetarian Sources of Protein),” https://healthwholeness.com/healthy-foods/high-protein-vegetarian-foods. DeLone, M., “Mushroom Spaghetti Squash,” StudentRecipes.com, October 10, 2015; https://studentrecipes.com/recipes/vegetarian/mushroom-spaghetti-squash. Haan, S., “How to Meet Your Protein Needs without Meat.” SparkPeople web site, http://www.sparkpeople.com/resource/nutrition_articles.asp?id=158, last accessed November 9, 2015. “Meatless Meals: The Benefits of Eating Less Meat,” Mayo Clinic web site, August 19, 2014; http://www.mayoclinic.org/healthy-lifestyle/nutrition-and-healthy-eating/in-depth/meatless-meals/art-20048193. Merker, K., “Pierogi With Sautéed Red Cabbage,” Real Simple web site, http://www.realsimple.com/food-recipes/browse-all-recipes/pierogi-sauteed-red-cabbage, last accessed November 9, 2015. Raisch, M., “10 Best Meatless Protein Sources,” Prevention, January 31, 2014; https://www.prevention.com/food-nutrition/healthy-eating/g20501802/10-best-meatless-protein-sources/?slide=2, last accessed October 2, 2018.